I have realized my second son does like to eat solid foods! I was simply feeding him at the wrong time. He's now approaching his meals with an open mouth and a little more gusto! 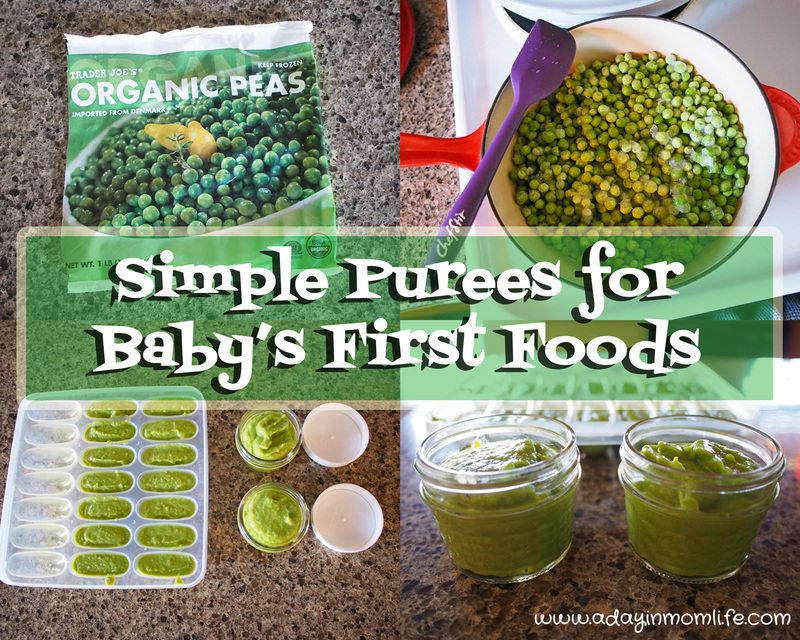 Read on for tips about scheduling feedings and basics on first purees! 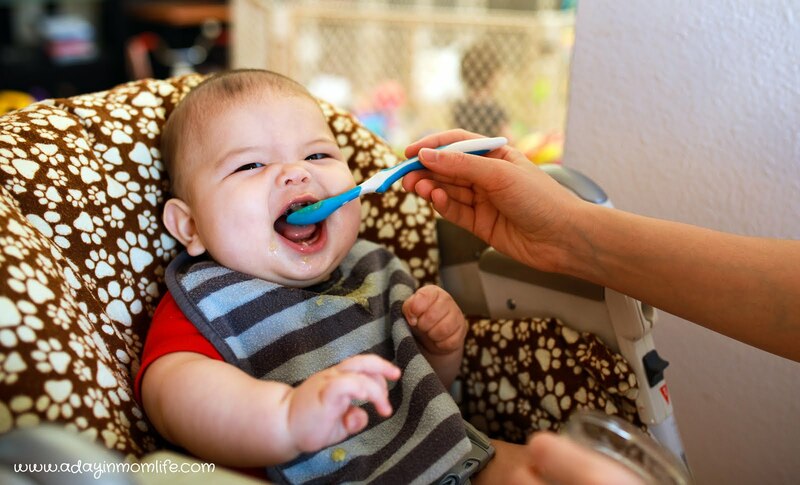 Really, there is no "right" time to feed solids. Immediately before breastmilk/formula, immediately after breastmilk/formula, an hour before or an hour after...it all comes down to what works best for your baby and also for your schedule. Keep in mind that up until a year baby's primary source of nutrition is breastmilk or formula. 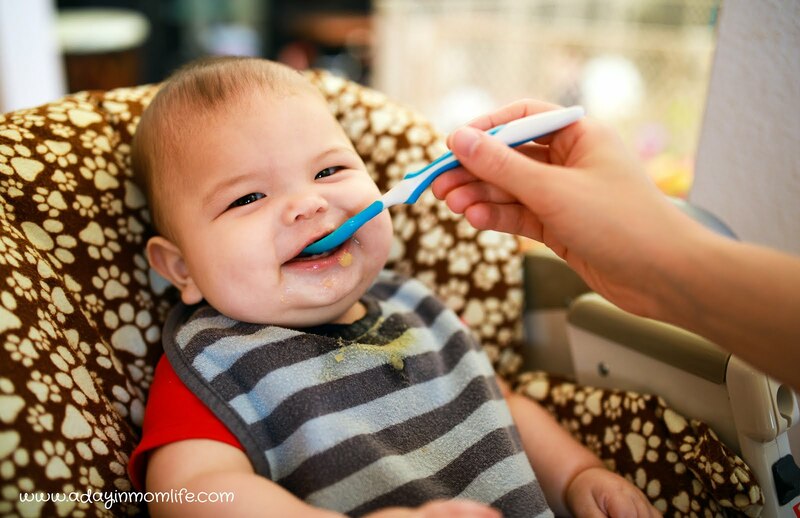 So, especially at 6 months, you are not looking to replace liquid meals with solid foods. Solid food is nutritionally inferior and also remember that breastmilk/formula is baby's source of hydration. Since Lucas was on a pretty strict eat/play/sleep schedule I was hesitant to mess with his breastfeeding after waking up. But...he was also really unexcited about solid foods. 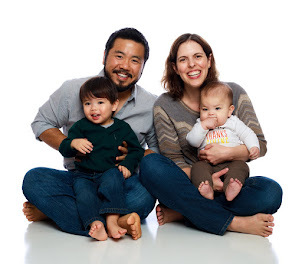 I looked back at Henry's 6-Month Schedule, 7-Month Schedule, and 8-Month Schedule. I never did eat/play/sleep with Henry and I tended to breastfeed him in the middle of his awake periods. I've also looked at a lot of baby schedules and I noticed when babies were bottle fed they tended to eat food and take a bottle as their "meal." For his morning meal, he eats food before breastfeeding. He typically still takes a lot of milk after, but if he takes less, he will just drink more before his nap at noon. Lucas sits at the table with us at lunch time (11:30) and I give him some small finger food options. But he has yet to navigate getting anything into his mouth! He is still much more interested in chewing on a teether toy, but he definitely watches us eat with growing interest. For his afternoon/evening meal, I breastfeed him first and then he joins us at the dinner table. Sometimes he eats his meal eagerly, other times not so much. If he sleeps late (6:00) and we are already done with dinner, I skip the meal entirely. Again, solid food is just a compliment at this time so I'm not concerned over how much he eats. For Lucas's first purees, I've made peas, cauliflower, potatoes, apples, green beans, oatmeal, and brown rice. I used frozen organic peas and cauliflower and fresh organic potatoes, gala apples, and green beans. I usually make 1-2 purees per week. I keep a small amount in the fridge and freeze the rest into cubes, then transfer the cubes into labeled freezer bags. Assuming 1 oz size cubes, for first meals I would use 2 cubes per meal. Or one cube and a fresh mix in, such as rice porridge and banana or apple and avocado. I thaw the cubes in Ball 4 oz glass jelly jars in the fridge overnight. Then I heat some water in the kettle and pour it in a shallow bowl. I put in the jar and let the food warm for a few minutes. Make sure to stir and check the temperature before feeding. My first son ate everything I gave him without question or complaint - even asparagus! I remember vividly the day I gave him oatmeal with peaches because the peach puree was VERY tart and it was the first time I ever saw him hesitate over food. He made a definite pucker after every bite, but he still ate it. After that, I usually mixed peaches with mango to mellow them out some. Lucas has much more definite opinions about his food... I figured out quickly he wants his food to be warm so I have to give it a good 5 minutes to heat up. He also does not like peas! The dislike was comically written all over his face. Peas are a bit of a strong flavor, so we are going to wait a few weeks and try again. I only have 2 (1 set) of these Freezer Trays, so I made the following foods whenever I had some extra time over the past two weeks. Fresh food requires some prep work. Always wash your produce, then peel and chop (if needed). Any veggie can be steamed, but for quick-cooking options like broccoli or green beans, just add 1/4 cup filtered water to your pot and bring to simmering over medium heat. Cover and cook until fork tender. Cool and puree in a blender with any leftover water. Veggies have some water naturally so you should not need much for blending, but just add a extra splash if the puree will not blend. I cook fruit the same way, adding only 1/4 cup filtered water to my pot. Apples or pears cook up in around 10 minutes. Potatoes are the one thing I would absolutely recommend steaming. Boiling potatoes requires a lot of water and depletes the potatoes of nutrients. Bring the water to a boil (you can hear it boiling) and then reduce to medium low and steam with the pot covered 10-15 minutes or until fork tender. Allow to cool and then mash with a fork, adding fresh breastmilk, formula, or filtered water. I tend to leave my potatoes thicker because fruit and veggie purees are thinner. Then when you mix them together you get a nice consistency. Steel Cut Oatmeal - I used extra filtered water (1/2 cup oats to 2 1/2 cups water) and extended the cooking time by 20 minutes to get them really soft. I also filled a jar for the fridge, but I regretted not making a full cup of oats so I would have ended up with more freezer cubes! Rice Porridge - Grind organic brown rice in a blender (dry) and then cook according to package (amount of water/rice ratio based on volume of blended rice). Keep an eye on it and add additional water if needed to get a smooth, thick porridge. I like to keep my grain purees thick so when I make a combo with veggies and/or fruit - for example brown rice, green beans, and apples (3 cube meal) - the final puree stays very thick and isn't dripping off the spoon. 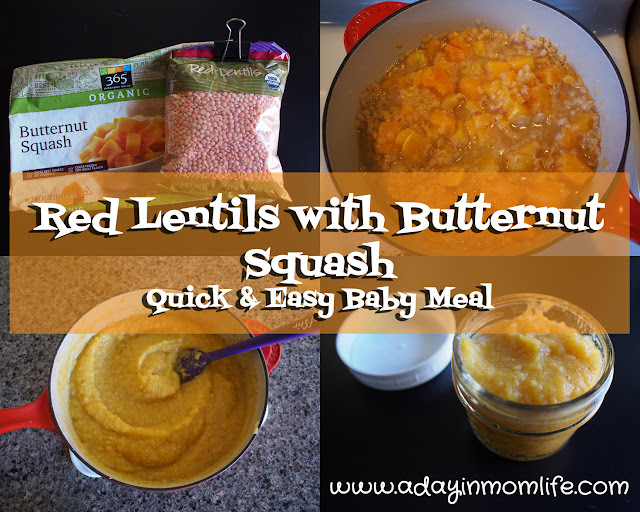 Thanks for reading and please check out my other Baby Food Posts! What is your baby's favorite meal? I love new combos! And any suggestions for first finger foods! That is awesome that he's enjoying solids so much more with the new schedule! My little guy is a BIG eater so I never had an issue with that, but I did notice he was much more willing to try new foods in the middle of the day, than the morning or night at first. We mostly did baby led weaning, so didn't make a lot of purees, but I do love using fruit purees to mix with oatmeal or yogurt. Also, I did not know that about potatoes losing their nutrients when you boil them, whoops! My son loves mashed potatoes, I'm definitely going to start steaming them instead, thanks for the tip! I read a lot about baby led weaning with my first son, but he just didn't get into finger foods until 8-9 months. Was your son into finger foods earlier? I know food is just extras, but I definitely got used to feeding my chunky purees. I used to do stuff like ground pork with sweet potatoes and bell peppers and barley with kale and asparagus and apples. I hope Lucas gets over the idea that things should taste like bananas! I roasted a sugar pumpkin to make a pasta recipe recently, gave him a little of the extra, and he sure made a "dislike" face for the pumpkin!